No matter how well I look after my gym T-shirts, they are, inevitably, going to wear out. I've been thinking about how I can keep this kind of textile waste out of landfill for a little while now, along with the textile waste from my making processes. So, I've started a few ongoing projects to ensure that everything can be repurposed. First off, the T-shirts. Even if they're worn through in areas, or the elastic has gone, they can still be turned into T-shirt yarn for other purposes. There are plenty of online tutorials on how to do this. My favourite is from Mollie Makes. Ignore the bit about needing a T-shirt without side seams – for most purposes, it doesn't really matter if your yarn includes seams. At the moment I'm making a mat, but I could just as easily knit, or crochet the yarn into something else such as a bag or even a new garment. Again, there are oodles of tutorials and ideas online – you can start here with Pinterest. Lately, I've been making a lot of toiles (or muslins for Americans) for my pattern drafting class, as well as having quite a few leftover bits from screen printing, so these pieces are being turned into waggas (make-do quilts). They're improvised with whatever is at hand and I'm just adding to them when the mood strikes. I also have a pair of pyjamas that are about to be worn through across the back. Buttons will be removed and kept for another project; the worn back area will have to be turned into strips that can either be made into a woven version of the T-shirt mat, or perhaps used for weaving; and the still-intact parts of the top will be cut into pieces that will eventually become a postage-stamp quilt. I also have a pile of long, thin strips, mostly of denim, leftover from a quilt I'm making from repurposed jeans. 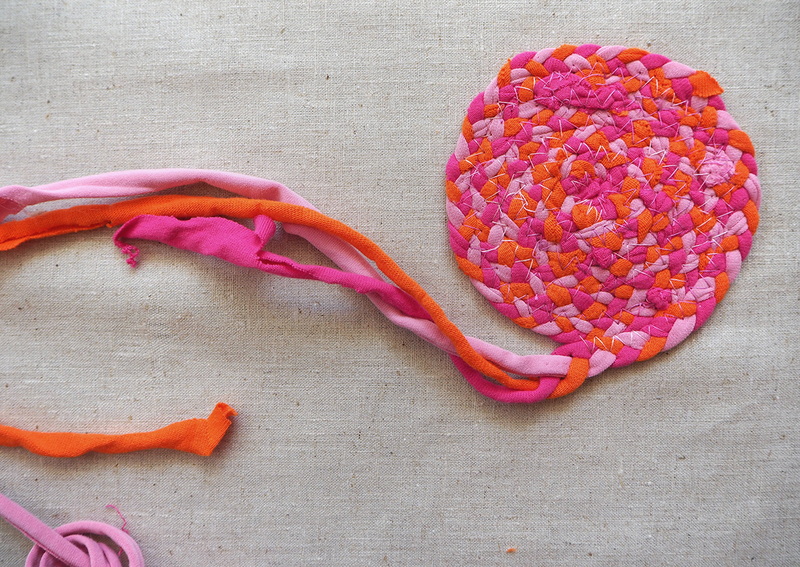 I have plans for weaving these, but they're a little way down the 'to-do' list at the moment. 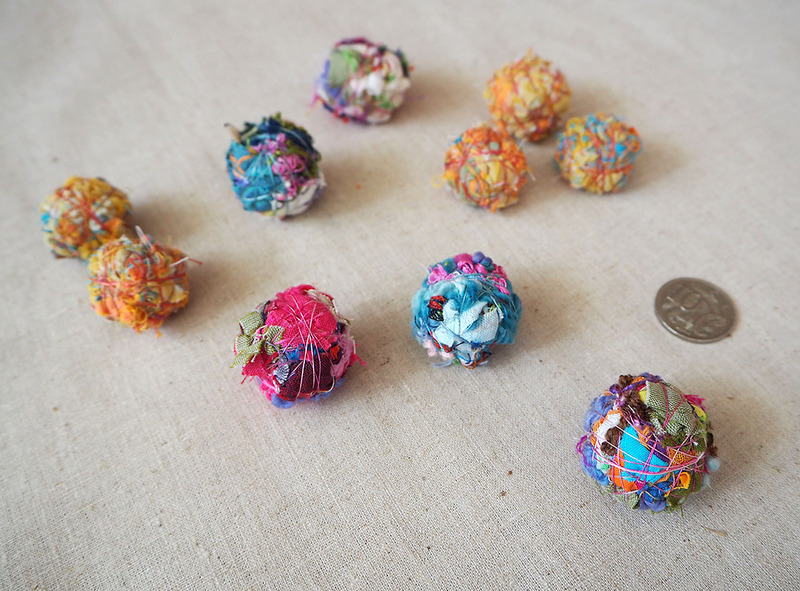 Last, but not least are the tiny scraps – too small for making anything useful – along with the thread offcuts, yarn ends etc that are the detritus of making. These, I'm turning into thread beads. 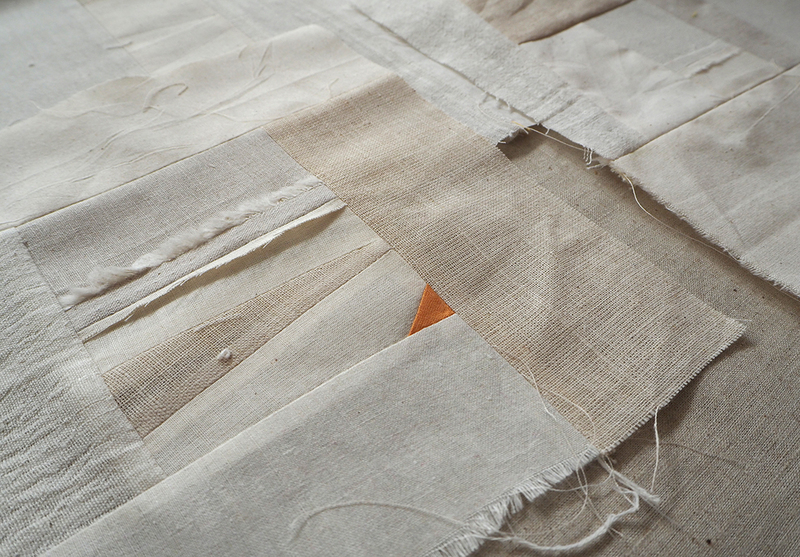 The pic below shows the ones made mostly from the leftovers of my exhibition quilt – 10c piece for scale. I hope this has given you some ideas for repurposing. If you want some background on the reality of the world's used clothing check out this Newsweek article that I found via The Fringe Association (the blog of Slow Fashion October's founder, Karen Templer).